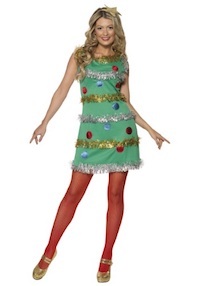 Christmas holiday parties are coming up and I know you’ve secretly always wanted to be a Christmas tree. Everyone is always Santa, an elf, or even wearing ugly Christmas sweaters, but no one ever thinks of being a Christmas tree. Now that’s a unique idea. 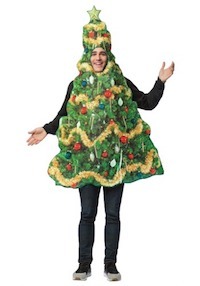 Now you can fulfill your dreams over the last 11 months of being a Christmas tree by dressing up as one for your holiday Christmas party either at work or during your family function. Who needs a fir tree when they have you? You will be the hit of the party. People will be laying down their gifts at your feet and oooo’ing and ah’ing and playing with your lights. 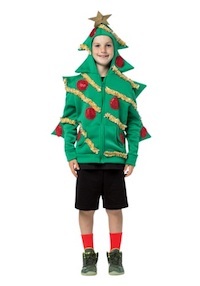 Below are Christmas tree costume ideas for adults and kids. This dress has tiers of rich, sparkly green tulle and a matching tiered pointed cap. It’s topped with a star so you’ll be able to see her sneaking behind the kitchen counters for one last gingerbread man. 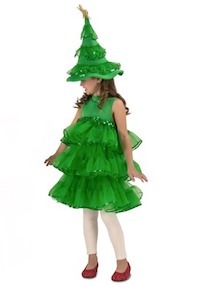 Click here to get the glittery Christmas Tree Costume for Children. 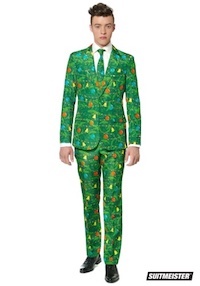 The Christmas Tree Suitmeister comes with a jacket top and pant set. The fabric has a festive pattern that features faux Christmas lights, ornaments and even bells. It also comes with a matching tie, so all you need to do is pair it with a white dress shirt and a pair of your best wingtip shoes to fully embrace the Christmas spirit. And the best part is that you’ll still be wearing a suit, so you don’t have to forsake your suit wearing ways. our kiddo can walk down the street and look as glorious as a fully decorated Christmas Tree with a star even on the top of his hood to complete this festive look. Help your little one spread the holiday cheer and grab him this awesome hoodie! Click here to get the Christmas Tree Hoodie for Kids. Click here to get the Christmas Tree Dress for Women.